NaNoWriMo | What's On My Nightstand? November 1st is the beginning of NaNoWriMo. 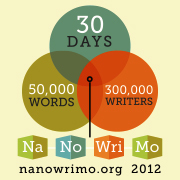 For the uninitiated, NaNoWriMo stands for National Novel Writing Month. Basically, people all over the world commit to writing a 50,000 word novel (about 175 pages) in one month’s time. That averages to about 1666 words a day. Seem impossible? I thought so, too. Until I did it, that is. Here’s the trick. You write. You don’t think. You don’t worry, and you definitely don’t edit. Never delete a scene you don’t like. This is all about the word count. You have December to edit to your heart’s content. It’s all about quantity – not quality. The funny thing is, sometimes, when you don’t restrict yourself or think too hard, the quality is surprisingly good. NaNo is all about having fun with writing. As the NaNoWriMo website states, it’s “Thirty days and nights of literary abandon.” Want to write a book about clowns on mars? Go for it! Want to write about the blog that took Manhattan by storm? Sure! Want to kill your favorite character, have long and pointless monologues, or have Johnny wake up and realize it was all a dream? Why not! NaNo is about having fun, breaking rules, and not worrying about the finished product. Just write! Oh, and don’t worry. No one reads it unless you decide to hand it to them. If you upload it to the site for counting, it will simply count and then delete it. Still worried? You don’t have to do this alone. People all over the world are signing up to write a book, and there are Write-Ins all over the place where you can join a group of budding novelists like yourself in coffee shops, libraries, etc. to help drive you to keep writing. You can even join us here at Oakton! Oakton Community College Library in Des Plaines is an official Write-In location. Check out our NaNo libguide for all our write-in times as well as other NaNo tips. Want to give it a try? Join us November 1st for our Kick-off celebration & write-in in room 2418 at the Oakton Library in Des Plaines at 10:00AM – 11:00AM and/or 1:30PM – 3:00PM. Bring a flash drive or have space saved on your cloud to store your book. Great blog you’ve got here! I’ll be sure to follow!